I know the Cincinnati Enquirer supports Jean Schmidt, but usually they can at least mask it better. Today, the Enquirer finally posted some coverage on the Jean Schmidt/David Krikorian hearings before the Ohio Elections Commission. As I was scrolling through the coverage, I discovered that the Enquirer left an older version of the article online. This allowed me to see an original version and a newer, edited version. Both were biased. But after the editing, the bias borders on outright lying. I’m posting a side-by-side comparison of different sections so you can see for yourself. Notice they don’t change the Last Updated time. Even though the title has obviously been changed. Reading the second title makes it sound like officials charged Krikorian with making false statements. Was that the case? Read on. This introduction, the Enquirer original, stated that Schmidt’s opponent probably made false statements during the election. How do you “probably” make false statements? So the Enquirer changed it to read made false statements. Hmmm … that’s different from probably made false statements. But is it true? Reading further in the original, we find out that what really happened was that a 3-person panel found probable cause to continue the hearings. Now this sounds like what actually happened: a 3-person panel found probable cause to continue the Schmidt-Krikorian hearings. However, this is very different from made false statements or probably made false statements. If you’re starting to think the Enquirer may be making some false statements, then you’re not alone. Well, an editor at the Enquirer must have seen this grain of truth in their story because in the edited version, they take out the statement about what happened – that probable cause was found to continue the hearings. 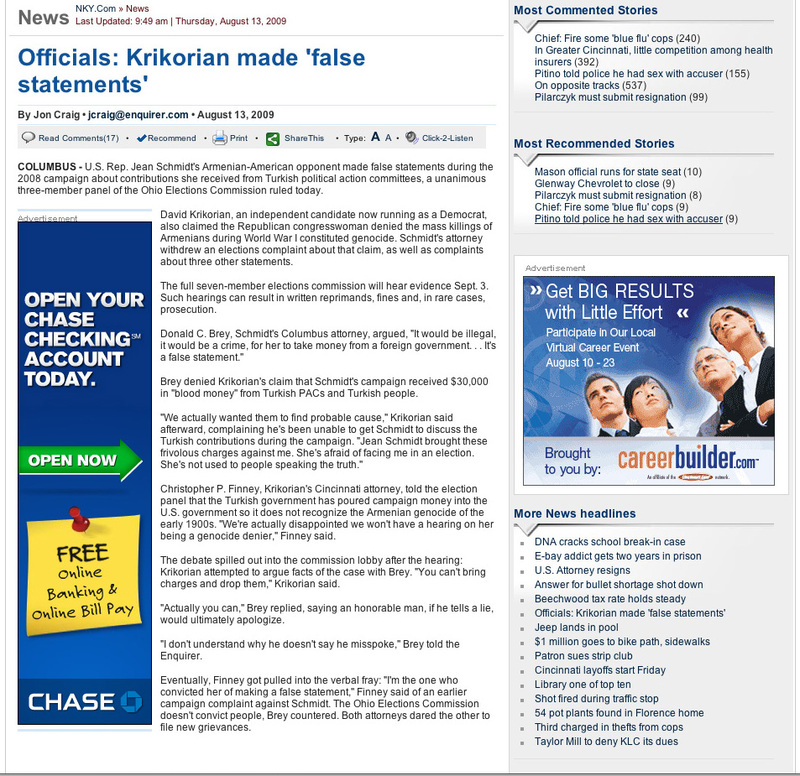 No one ever said Krikorian made false statements. Except the Enquirer. In the title of the article. If you’d like to compare the two versions, click the original or the edited version. Since I made these screen captures, the Enquirer changed the edited version back to it’s original. Perhaps even they realized they’d gone too far in bending the truth. Sibel Edmonds, a former Turkish translator for the FBI, testified that the Turkish government had bribed members of the U.S. Congress. Jean Schmidt took over $30,000 in campaign contributions from Turkish lobbyists. Jean Schmidt became one of the most vocal opponents of a resolution recognizing the Armenian genocide (a proposal the Turks wanted squashed). This sounds an awful lot like a foreign government bribing a U.S. elected official, an issue that I would think would resonate with all Americans. Maybe the Enquirer should, I don’t know, investigate this? Instead, the Enquirer prints the article in such a way that you would think the $30,000 was made up by Krikorian. No one disputes that she took the money. Not even Jean. This is a matter of federal record which a reporter should be able to verify easily. The Enquirer also doesn’t mention how witness testimony supported Krikorian’s claims. The Enquirer also doesn’t mention how Jean Schmidt dropped several of the charges after hearing the testimony. Krikorian wanted the trial to be held because in libel cases, truth is a defense. He wanted Sibel Edmonds to testify. Schmidt thought that her testimony would be blocked by the DOJ. Instead, her testimony corroborated much of Krikorian’s case. Why did she drop charges? Because the evidence didn’t support them. Did the Enquirer mention this? Not at all. The veracity of the remaining “charges” will be decided at the next hearing. This is what actually happened at the hearing. To read more about actual events in this strange case go here. But once again, what does the Enquirer print? It’s too bad there’s no commission to judge newspapers for making false statements. Indeed, what the debate involving Schmidt and Krikorian is all about? Is it about a disputed history of distant Armenia and Turkey, which today has no relation to American citizens, or is it about false and unethical defamation campaign with an ethnic-racist overtones? I think the original title “State hears Schmidt genocide case” was utterly inaccurate and even misleading, while the second title “Officials: Krikorian made ‘false statements'” reflected the news as it is. As to the debate about a disputed Armenian genocide, this issue today has to do more with politics than with history. Armenia uses this dispute to stir up anti-Turkish sentiments and keep alive its territorial claims against Turkey. This issue should be left to historians and not politicians of different sorts to decide. “Neither this Government nor previous British Governments have judged that the evidence is sufficiently unequivocal to persuade us that these events should be categorised as genocide as defined by the 1948 UN Convention on Genocide, a convention which is, in any event, not retrospective in application”. Of course Troy’s source is a trustworthy one (government site) but it actually doesn’t relate to the Schmidt case at all. All it does is show that there is support for Schmidt’s views, not whether she was bought off or not. Completely irrelevant.